'Catalyst' art dealer 'not interested in others' bitterness' | Daily Review: Film, stage and music reviews, interviews and more. The Queensland commercial art dealer, Suzanne O’Connell, who received $485,000 in government money to fund an indigenous art exhibition in Monaco responds to criticism of the grant and explains why she is not a signatory to the Indigenous Art Code. “It’s all good! Hello?” Suzanne O’Connell says down the phone from her Brisbane gallery. She seems at a loss as to why people would find the idea of taking a massive show of work by 50 contemporary indigenous artists from Queensland for a six month exhibition at the Oceanographic Museum of Monaco so objectionable. And object many have. Since the art dealer received the funds for the show in Monaco titled AUSTRALIA: Defending the Oceans at the Heart of Aboriginal and Torres Strait Island Art from the Federal government’s controversial Catalyst arts grant program (funded by its raid on the Australia Council funds), the internet has rippled with artists and arts workers commenting on the size of the grant and the intent of the show. Some have argued that so much money should not be given to a commercial gallery to fund a show in an oceanographic museum — in Monaco of all places — when those funds could fund local, not for profit, indigenous galleries. 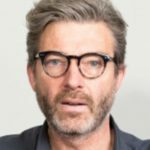 One of the few to go on the record, Tom Mosby, the CEO of the Koorie Heritage Trust told Daily Review: “$500,000 is a large amount for any organisation and as a not for profit indigenous art organisation we are dependent on government funds – even half of $500,000 would go a long way to do what we do – where we have a broad remit in Victoria to support and celebrate Aboriginal people and culture”. But O’Connell is having none of that. “Anyone can go for it love,” she says of the criteria the government set for its Catalyst funds. She feels no need to apologise for what she sees is a huge opportunity for Queensland indigenous art centres and its artists who, she says, are over the moon about the project. From next month their art — sculpture, installation, painting and objects will not only be inside the 19th century cliff-face museum in Monaco, but will be crawling up its exterior. 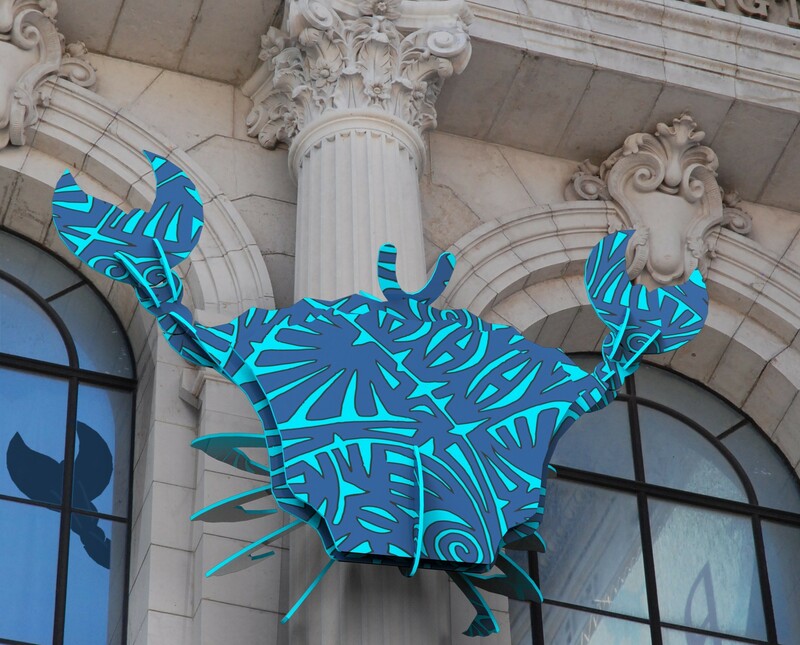 (Brian Robinson will cover the museum façade in an installation of Malu Githalal (ocean crabs). The museum’s rooftop will see Torres Strait Islander artist Alick Tipoti (pictured with O’Connell below) install a 670 square metre stencil floor work representing a giant sea turtle. O’Connell has a very long and respected history in dealing in indigenous art — she’s (affectionately) known as ‘Marilyn’ in indigenous communities because of her platinum, Monroe-esque hairstyle. She says her motivation for the project was to let the world know about Queensland, its Barrier Reef and its indigenous artists. When she travels to Monaco next month for the opening 20 artists and dancers will travel with her to participate in events and a schools’ education program — “No one mentions that, do they?” O’Connell says of her critics. As for the Oceanographic Museum (exterior pictured below) as a venue, she says: “If it’s good enough for Damien Hirst to have a major show then I think it’s pretty good”. The museum’s annual practice since 2010 has been to ask major artists to present works on ocean themes. Artists have included Damien Hirst, Huang Yong Ping, Mark Dion and Marc Quinn. O’Connell rejects criticisms of her using government funds for the project. “The money isn’t going to me, it’s going to the art centres. I just get a fee — and it’s not much given the time I’ve put into this.” (Her management fee is 8 per cent of budget). “It’s not a commercial show; it’s not for sale,” she says of the total $1.24 million budget for the project. Before she applied for Catalyst funds she was raising money for the project which includes $300,000 from private donors, funds from Arts Queensland and even $50,000 from the Australia Council for one community art centre to participate in the show. “The Australia Council said to me ‘we support you and you should apply for Catalyst funds because it fits its criteria like a glove’,” she tells Daily Review. But O’Connell feels no need to be a signed up member of the Indigenous Art Code despite her long-term work with indigenous community artists. “I don’t have to be. I’m a member of the ACGA,” she says of the Australian Commercial Galleries Association which has its own code of ethics. Nor does she feel that she needs to even be seen to be signed up to the Indigenous Art Code given she works so closely with indigenous artists. AUSTRALIA: Defending the Oceans at the Heart of Aboriginal and Torres Strait Island Art is a major survey of contemporary artworks by Aboriginal and Torres Strait at the Oceanographic Museum of Monaco as part of the exhibition Taba Naba – Australia, Oceania, Arts of the Sea People from March 24 to September 30, 2016. Main image: Suzanne O’Connell. Photo by Lyndon Mechielen. All images courtesy of Suzanne O’Connell Gallery. There are a number of interesting points raised here. Today’s news that Fifield is returning the funds to Aus.Council is great news. That is a great relief. As soon as he was made Minister I wrote to him (no reply) to say the decision Brandis had made would spell disaster to the industry. Here in Sydney I have watched that disaster unfolding. Many colleagues of 30 years who run small/medium size companies have gone to the wall. This is sad because they have given so much for so long and in doing so have earned little, and the very best represent the engine house of innovation in Australian arts. To see all that diminished and dissolved has been unnerving for those of us who remain. The future will now be a lot harder. Where did that money go and what was the benefit? The exhibition at the Oceanographic Museum Monaco was actually devised in 3 parts. For the most commercial art dealers ‘curated’ the bulk of the space with varying degrees of success. Suzanne O’Connell is listed as an associate curator, and her senior curator was Stephane Jacob, who runs commercial gallery in Paris. 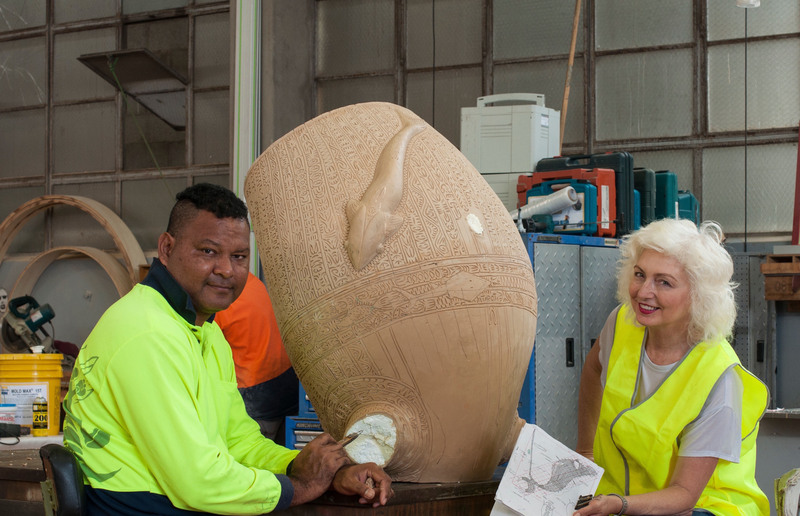 They created a large rambling set of displays called “Defending the Oceans at The Heart of Aboriginal and Torres Strait Island Art” or the short version Taba Naba. I have not read any reviews of that section of the museum. Aside from the O’Connell/Jacobs presentation, the museum commissioned another’ exhibition, quite separate in the Prince Albert I Room on the second level of the building. This was called “Living Waters”, and was curated by Dr Erica Izett and Prof. Ian McLean. This scholarly exhibition with associate curation from AAMU-Aboriginal Museum Utrecht, the National Maritime Museum, Sydney and the National Museum of Australia was a complex study of water and indigenous belief systems. It loaned rare works from a number of major private and public collections in Australia and Europe, and the academic outcomes were substantial. The thrust of Living Waters was to create an exhibition that demonstrated how Indigenous and Western knowledge systems brought together intercultural exchanges. On the occasion a significant book was published with support by the French Sordello-Missana Collection in Nice, who have had a long professional association with Izett/McLean. 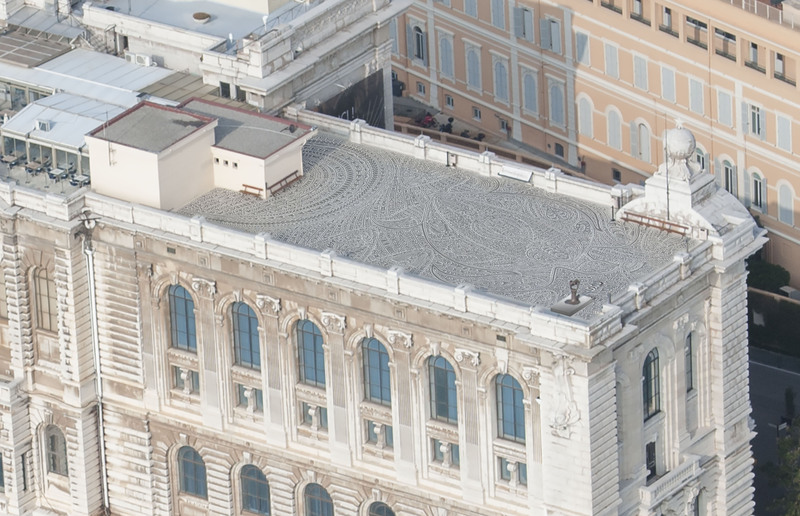 Perhaps the art hype already mentioned and the Brandis negativity here in Australia concerning O’Connell and Catalyst, has managed to diminished the importance of the other projects in Monaco. The Oceanographic Museum has a long history, science based research, but also as a major centre for marine conservation. French filmmaker Jacques Cousteau was the director from 1957-1988, and the institution continues to enjoy international acclaim. The attendance to the museum is close to 1 million people per year. “Taba Naba” opened in early April and closed September 30, a lengthy 6 month season. It is certainly one of the favourite cultural destinations in that part of the world. There are many ways to read contemporary art, and different contexts and, new and different kinds of audiences must be a positive in any kind of analysis especially those affecting public funding. Interesting that no Australian Art Institution people have spoken about this. Obviously the Turnbull Liberal Govt has got them scared as funding is always being cut. In the end its all about people keeping their jobs in the public service that runs Australian Government Art. Also Suzanne is being very disingenous when she blithely spouts “Oh Darhling just apply!” As if the whole thing is a Gold Coast social laugh. Which for her it probably is. We all know that this will the a one off grant. The Visual Arts won’t get any money for some time now. So we really need to see TOTAL TRANSPARENCY here please. How do we know this is all proper? But we will never find out…that’s the sad fact! Look I know Suzanne from years ago. I do hope her personal views on Indegenous people have softened from those times with her direct one to one with Indigenous people. BUT I’m sorry Suzanne started in Fine Art in 2001 or so, much later than many others and I think it fair to say there must have been some “who you know not what you know” in this Grant from the Liberal Government. Also Damien Hirst has shows everywhere, just because he had a show in Monaco does not mean its some world art centre!! Its called Hype Suzanne! If Ozco and Catalyst are “complementary”, how can a single project be funded through both programs? “It’s not a commercial show; it’s not for sale,” – it is an exhibition of the works of 50 contemporary indigenous artists, a number of whom will be travelling to the International Exhibition along with their art…. Do you realise that using the term “art dealer” in the title gives the impression that it is a commercial operation and all about sales? The two separate introductory paragraphs in the Daily Review email also give the same impression to anyone who does not read the article in full. Yes, her background is relevant, but reading “The Queensland art dealer who controversially received almost $500,000”, “Queensland commercial art dealer” and “‘CATALYST’ ART DEALER ‘NOT INTERESTED IN OTHERS’ BITTERNESS'” before reading any context within the article seems somewhat misleading about the nature of the exhibition / project, at least to someone who is not in the arts. It not not true. This show is for sale ! As curious as it could be, please have a look on the website of Stéphane Jacob Gallery and then you will find the artworks of Monaco for sale ? So it means the government paid to highlight through exhibitions, two dealers who receive a large fee for their work during 4 months, and at the same time behind the door they are selling the artworks with a large commission. It is unfair for the art centre and also for the other ethical art dealers on the market. I think the real objection underlying all of this is that A-G George “Bigot” BRANDIS is the Darth Vader figure who rorted the Australia Council funds for this “Bookcase’s” pick of where to allocate. Dividing “the Arts Community” plays very much to the tune set by the philistines of Shirt-Fronter ilk.